ETH Zürich (Switzerland) researchers have found a hitherto unknown molecular mechanism that is driven by fructose and can lead to cardiac enlargement and heart failure. “Walk through any supermarket and take a look at the labels on food products, and you’ll see that many of them contain fructose, often in the form of sucrose (table sugar)” – that’s how Wilhelm Krek, Professor for Cell Biology at ETH Zurich’s Institute for Molecular Health Sciences, summarises the problem with today’s nutrition. Prepared foods and soft drinks in particular, but even purportedly healthy fruit juices contain fructose as an artificial additive – often in high quantities. In recent decades fructose spread throughout the food market, due to a reputation as being less harmful than glucose. In contrast to glucose, fructose barely increases blood glucose levels and insulin secretion. This avoids frequently recurring insulin spikes after any glucose consumption, which are judged harmful. In addition, fructose is sweeter to the taste. But there’s a downside: the liver converts fructose very efficiently into fat. People who consume too much high-fructose food can in time become overweight and develop high blood pressure, dyslipidaemia with fatty liver and insulin resistance – symptoms that doctors group together under the name metabolic syndrome. When a person has high blood pressure, the heart has to grow as it is harder to pump the blood through the circulatory system. 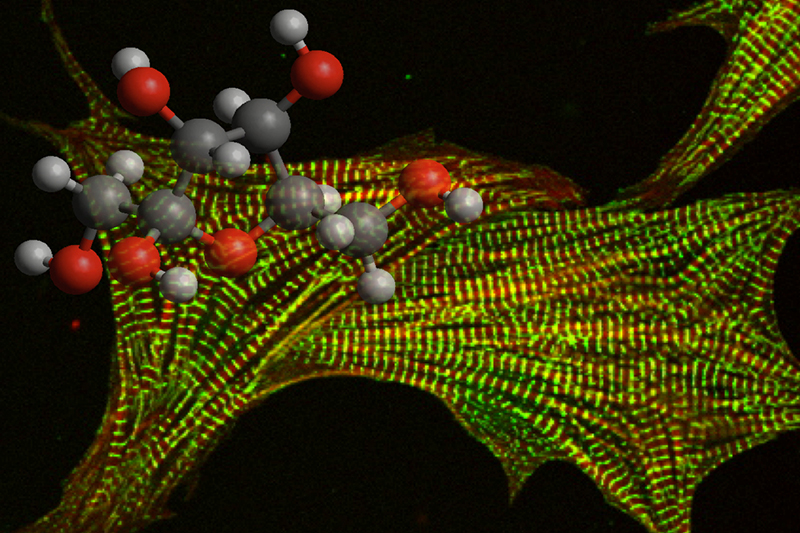 These growing heart muscle cells require a considerable amount of oxygen. However, since not enough oxygen is available to adequately supply the increased growth, the cells switch to an alternative energy supply. Instead of drawing energy from fatty acids, they rely more on an anaerobic process called glycolysis – literally, the “splitting of sugars”. If the heart muscle cells can access fructose in addition to glucose, this can set off a fatal chain reaction. In the study, Krek’s research group demonstrates that a lack of oxygen in the heart cells cues the appearance of the HIF molecule. This is a universal molecular switch that flips whenever a pathological growth process is under way, such as cardiac enlargement or cancer. HIF causes the heart muscle cells to produce ketohexokinase-C (KHK-C), the central enzyme in fructose metabolism. KHK-C has a high affinity for fructose and can therefore process it very efficiently. The production of KHK-C also has a reinforcing effect on glycolysis. Since fructose metabolism doesn’t involve any negative feedback regulation, a vicious cycle starts that can lead to heart failure. But Mirtschink provides reassurance that eating a normal amount of fruit daily is safe and healthy. “Besides fructose, fruit contains plenty of important trace elements, vitamins and fibre,” he says. People should, however, avoid overly sweet soft drinks and fruit juices – these often have sugar added – as well as ready-made meals and other foods to which large amounts of fructose are added as a flavour carrier. “Just this surplus of fructose can help trigger the mechanism we have described if one of the stress factors is present, such as cardiac valve disease or high blood pressure,” Mirtschink emphasises.